Laurie Anderson is a musician, filmmaker, writer, digital arts creative pioneer and, ultimately, a storyteller in the broadest sense. In 1987, her bond with the Directors’ Fortnight began as she presented her first feature film, Home of the Brave, now a cult film-concert. It is therefore natural for the Directors’ Fortnight to invite her this year to present a new form of her exploration in storytelling: the entirety of her recent virtual reality creations, co-signed with new media creator Hsin-Chien Huang. Aloft, Chalkroom and To the Moon, three poetically linked and complementary pieces presented together for the first time, give viewers a comprehensive overview of their research in these new narrative territories. The sensory, poetic and technological dimensions of these three pieces are tightly intertwined and offer new forms of storytelling by amplifying our cinematic experience. It is this singular and fully authorial, approach of virtual reality, that the Directors’ Fortnight wishes to highlight, honour and share. Laurie Anderson’s artistic path is a testament to the Directors’ Fortnight’s exploratory spirit, and to this 51st edition, aiming to be both an observatory and a laboratory of the evolution of storytelling through moving images, as well as an echo chamber for all forms of creation in this field. 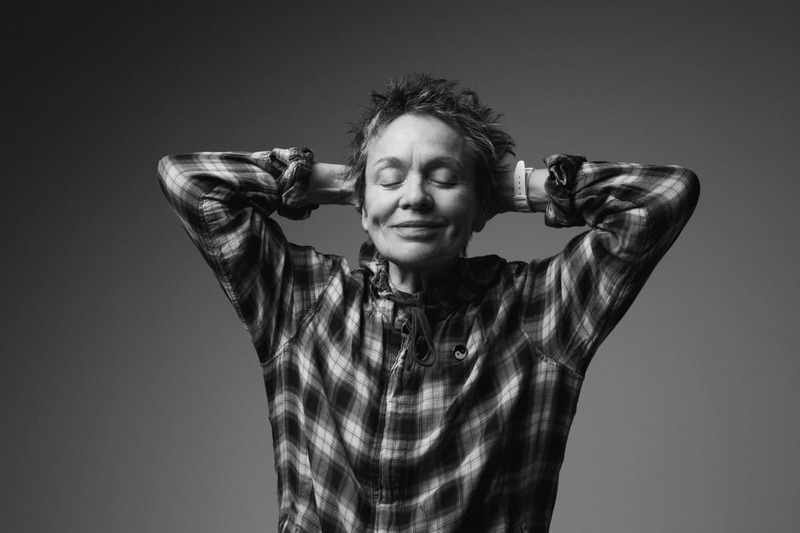 Laurie Anderson is one of America’s most renowned and daring creative pioneers. Best known for her multimedia presentations, innovative use of technology and first-person style, she is a writer, director, visual artist and vocalist who has created groundbreaking works that span the worlds of art, theater, and experimental music. Her recording career, launched by “O Superman” in 1981, includes many records released by Warner Records among them “Big Science” (1982), the soundtrack to her feature film “Home of the Brave”(1986) “Strange Angels” (1989) “Life on a String” (2001) “Homeland” (2008) and “Landfall” (2018) released on Nonesuch which recently won a Grammy Award in 2019 for Best Chamber Music/Small Ensemble Performance. In 2002, Anderson was appointed the first artist-in-residence of NASA which culminated in her 2004 solo performance “The End of the Moon”, the second in a series of three “story” performances along with “Happiness” (2001) and “Dirtday” (2012) all of which toured extensively internationally. Anderson has published eight books. Her most recent release, “All The Things I Lost In The Flood” (Rizzoli), is a series of essays about pictures, language and codes. Anderson’s films include numerous music videos and installation works as well as Home of the Brave 1986 (included in Quinzaine des Réalisateurs), Carmen (1992), the high definition Hidden Inside Mountains (2005) and Arte-commissioned Heart of a Dog (2015) which was chosen as an official selection of the 2015 Venice and Toronto Film Festivals. In 2017 Anderson joined four other artists in Mass MoCA’s Building 6 inaugurating a fifteen year rotating exhibition of work. Anderson will show pieces from her archive as well as new work. Included in the first exhibition cycle are her virtual reality collaborations with Hsin-Chien Huang Chalkroom and Aloft. Chalkroom has been featured in film festivals all over the world including the Venice Film Festival where it won the award for “Best VR Experience” under its Italian title “La Camera Insabbiata”. Along with their work Aloft and To the Moon it will be presented at the 2019 Cannes Film Festival as “Look Where You Go!” Anderson will have a major exhibition of her work at the Hirshhorn Museum in Washington DC in 2020 and will be working with Hsin-Chien Huang on a major new piece for the Manchester International Festival. Hsin-Chien Huang is a new media creator with backgrounds in art, design, engineer and digital entertainment. His career endeavor explores cutting edge technologies in art, literature, design and live performing. His projects often involve large-scale interaction, performing, mechanical apparatus, algorithmic computations and video installations. He received the Fulbright scholarship as a visiting scholar in 2019. His VR collaboration with Laurie Anderson was awarded the Best VR Experience in 74th Venice Film Festival. He won the Fifth Public Art Award from the Ministry of Culture Taiwan in 2016, the Light of Taiwan’s Honor from Taiwan’s President Ma in 2011, the Muse Award of America Association of Museum in 2009 and the grand prize of «New Voices, New Vision» new media competition in 1994. Hsin-Chien’s art works has been exhibited in galleries, art museums, film festival and TV program around the world. The art events and venues include National Taiwan Museum of Fine Art, Venice Biennale, MOMA, Louisiana Museum of Modern Art Denmark, Shanghai Biennale, OK Center in Linz, Beijing 798, Herbert F. Johnson Museum of Art and 404 Festival in Argentina, among others. His live performing project was shown at SIGGRAPH 2015 and the America’s Got Talent 2018 TV show and made the judges to wear VR for the first time. He has been commissioned to create concert visual design for Taiwanese Singer Jay Chou, Wakin Chau and Jody Chiang. 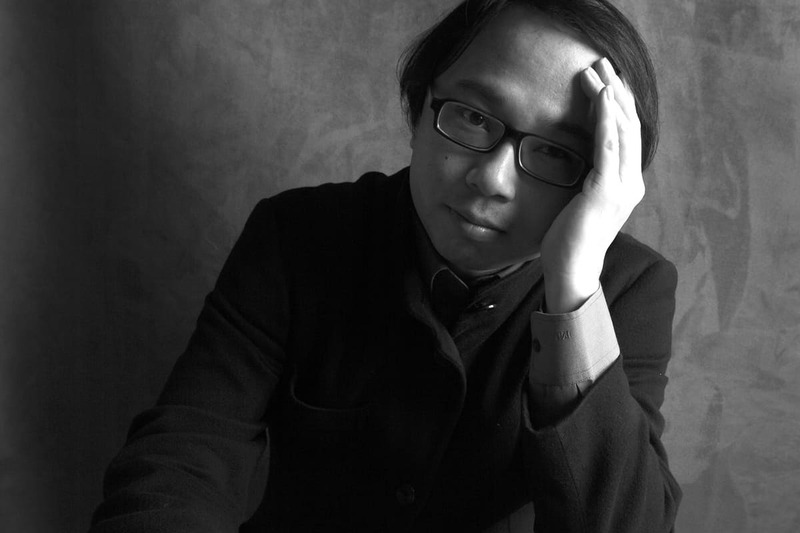 His large-scale interactive installations had been shown in Shanghai world expo 2010. He had worked as an art director at Sony and Sega computer entertainment from 1994 to 1999 and created global launch titles. Hsin-Chien also is a full-time professor at National Taiwan Normal University and collaborate with Yahoo Taiwan on Vtuber projects. Laurie Anderson and Hsin-Chien Huang first collaborated on the CD-ROM Puppet Motel in 1995. Since then they have collaborated on several digital art forms and are planning some joint exhibitions of their work to be shown in Taiwan and Washington DC. ALOFT is the first VR work that Hsin-Chien and I made together and it begins in a plane that’s about to take off. You settle into your seat, look out the window. You can also get up and move up and down the aisle. Then the plane begins to fall apart. Your worst nightmare. Except that this time it’s gentle. 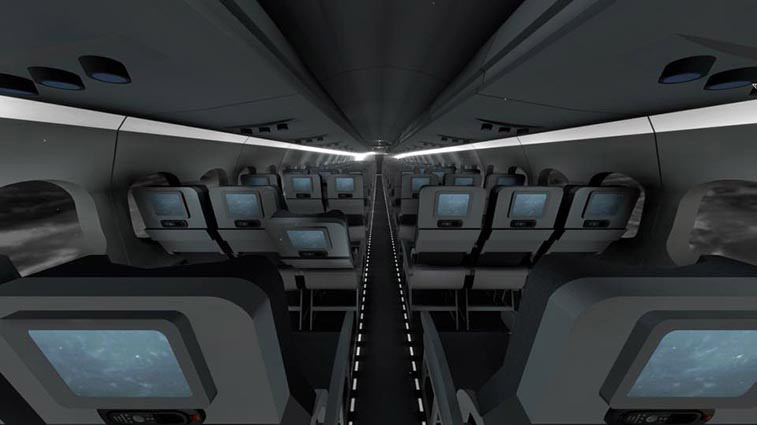 Suddenly you’re floating in your seat past the black box towards a large luminous vortex. CHALKROOM is a virtual reality work in which the participant flies through an enormous structure, a seemingly endless edifice made of words, drawings and stories. Once you enter this space, you are free to fly and explore wherever you want. You can navigate across chasms, follow along narrow bridges, zoom through doors, jump off ledges, sail up, out of and around the edifice. Meanwhile, words float through the air. They fall into dust. They form and reform. It’s a world made of language and stories- spoken, written and drawn. TO THE MOON uses images and tropes from Greek mythology, literature, science, sci fi space movies and politics to create an imaginary and dark new moon. 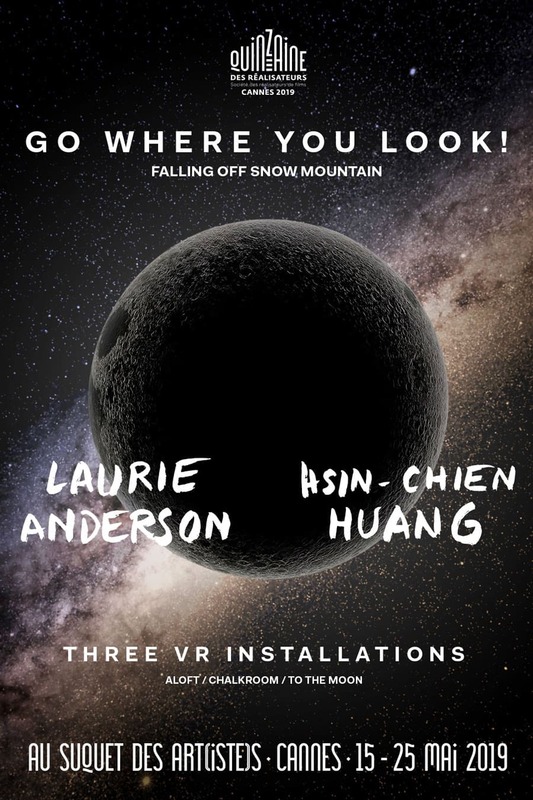 During the 15-minute VR experience, the viewer is shot out from earth, walks on the surface of the moon, glides through space debris, flies through DNA skeletons and is lifted up the side and then tossed off of a lunar mountain.